These exterior colors all use a Craftsman-style house as the "canvas." 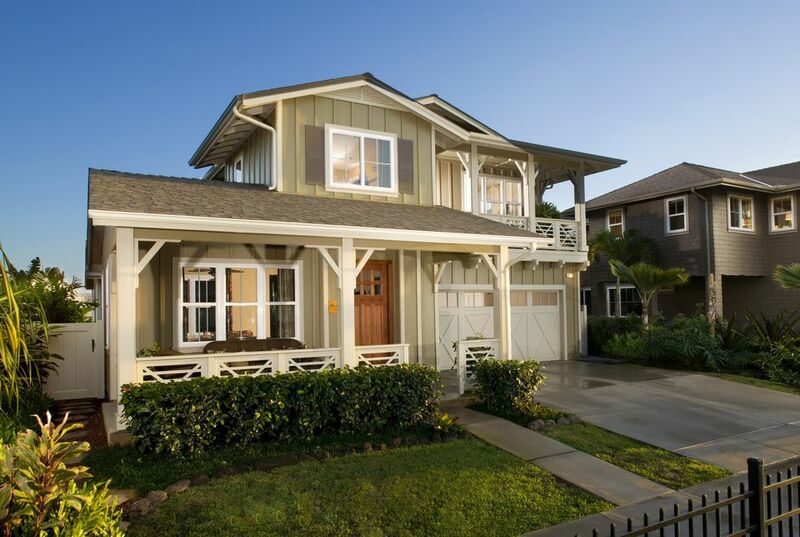 Craftsman is a popular house style and allows for wide expanses of paint coverage. More importantly, Craftsman is big on millwork--door casing, window trim – and this allows for a bold presentation of color sub-families. These examples cover three sub-families of green: neutral, medium, and bright. Within each sub-family may be another color sub-groupings: light, medium, and dark. This exterior paint scheme is light and cheerful, mostly due to the Irish Paddock field color and the high contrast of the Du Jour trim. All colors are from Valspar, a major paint manufacturer whose products are found at Lowe's Home Improvement. Field color – the largest expanse of color – is always the first one listed. If the house looks identical in every picture, except for colors, it is. This is intentional. The reason: so that you can scroll down the screen and easily contrast colors without extraneous features influencing you. This is a decidedly stable earthen-green exterior paint scheme using Slate Green. All trim pieces, and even the door, remain within this earthen palette. The controlling idea is to keep all four colors relatively within the same range, for a pleasant symphony of hues that evoke a mountain cabin or hostel. If the idea of painting your house green makes you nervous, this is a safe way to go about it. Still within green neutrals, this is the darkest end, the appropriately named Dark Green 5. This green is subtly off-set by the slightly lighter Dark Green 4. Yellow-y Apple 3 provides necessary punctuation for the bottoms of the pillars. Use yellows sparingly. It doesn't take much yellow to make a statement. This is the green for a true green lover. Almost a lurid Granny Smith apple green, this color reflects more light than practically any other color scheme in this gallery. If you're interested in the woodsy look, then look no further than this Pine Green field color. It's easily complemented by white/gray neutral variations for the trim. Light trim is what makes this house stand out from the dark background of foliage. We all know that green is based on blue. But how much blue tint do you want to add before the blue takes over? This is a very blue green, still in the Dark Forest Green family, though. What makes this paint scheme so unusual is the addition of the trim colors that have a pinkish tinge. Apply this kind of color scheme to your house only if you want to be noticed. Now, onto the lightest grouping of green house paint color ideas. This one is Lime Sherbet. With white trim, this green would be fairly shocking, even hard to stomach. But with a trim in the same general color grouping, you can make this work. A bright, summery green in the medium-bright grouping. A slightly lighter green (Delicate Frost) at the base of the posts echoes the house's field green. Will you ever get tired of this color? Perhaps. But you'll have fun with it before you change it out. Finally, the darkest green within this "bright green" sub-family that we are featuring. Valspar's Backstroke is a rich, moody, blue-tinged green that works well with the Paradise Green trim. If green can ever be called happy, this is the happiest form of this favorite color. Field and trim colors both radiate, combining to form a house that you'll be happy to come back to every night.